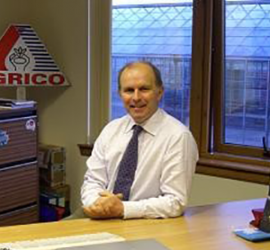 Archie is the Executive Director of Agrico UK Ltd, a subsidiary of a Dutch farmers cooperative Agrico BV a leading breeder and merchant of seed potatoes to more than 80 countries world wide. Archie has a post graduate diploma in Surveying and Land Management gaining experience in a variety of land agent roles before joining the food industry in 1999. Most recently with Baxters Food Group he undertook a broad spectrum of appointments including key account management with responsibility for Customer brands including Marks and Spencer, Waitrose and an interesting portfolio of export customers from Norway via Italy to Australasia. An active member of the Food & Drink Federation Scotland (FDF S) he was Chairman between 2009 and 2017 during which time he participated in the far reaching review on food defence and resilience led by the Centre for the Protection of National Infrastructure / British Standards Institute (BSI), to develop a specification – PAS 96. Most recently he was one of 4 Agricultural Champions appointed by The Scottish Government tasked with undertaking a review of Scottish Agriculture, taking into consideration Brexit and UK exiting the common Agricultural Policy (CAP). He also contributes to the National Council of Rural Advisors in Scotland, is an advisory panel member for AHDB and a director of The James Hutton Institute (JHI). Amongst other interests Archie is a keen supporter of skills development in the work force and an active participant in a number of Innovate UK supported projects to further science in agriculture. He is periodically a guest lecture at the University of Aberdeen, where he has discussed supply chain dynamics with Master Students studying marketing.